In yet another example of some morsel of news carrion being dragged all the way up to the top of the White House before being partially digested and regurgitated onto a bunch of Twitter eggs, Donald Trump accused tech giant Google of aiding the Chinese military (as well as “Crooked Hillary Clinton”) on Saturday. The apparent context for this rambling missive appears to be a spat this week involving the chairman of the Joint Chiefs of Staff, Joseph Dunford, who during a Senate Armed Services Committee hearing accused Google of refusing to aid the U.S. military while simultaneously providing an (unspecified) “direct benefit to the Chinese military.” Dunford did not elaborate on what, exactly, he was referring to, but the refusal to work with the U.S. almost certainly refers to Google’s decision to pull out of a gigantic drone AI imaging program for the Pentagon after numerous employees raised ethical concerns or even resigned. What Dunford (and the president) believe Google is doing for China is less clear. Google has limited operations in the country after pulling out amid censorship and human rights concerns, but it’s been reported to be planning a return to the Chinese market with a secretive censored search engine codenamed “Project Dragonfly.” More troubling, as Acting Defense Secretary Patrick Shanahan seemed to hint during the hearing, the Pentagon views normal day-to-day economic transfers of civilian technology between the U.S. and China as a threat, given the extensive ties between China’s civilian economy and its military. Most likely is the president heard some kind of sound bite about Google and China related to the hearing, but did not mull the specifics before using it as an opportunity to lob another wild accusation at the company. Over the course of the past year, Trump has baselessly accused it of blacklisting his speeches, favoring liberals in search results, and other nefarious plots against him. Add aiding the People’s Liberation Army to the grudge list. 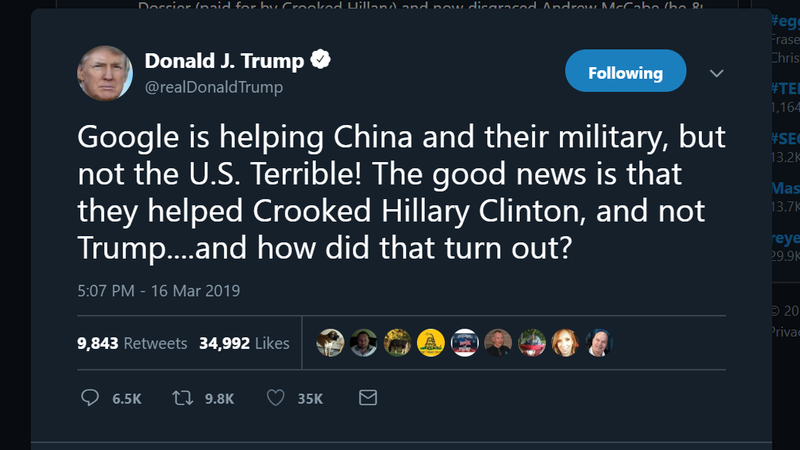 In any case, the president seems to live in a state of perpetual present and regularly airs new grievances against perceived enemies before bothering to elaborate on past ones, so there’s a pretty good chance this Google-China stuff will be forgotten by tomorrow. Also today, just days off from a horrific far-right terror attack on mosques in New Zealand that killed at least 50 people and wounded dozens of others, Trump tweeted another video with ominous music alleging that undocumented immigration to the U.S. is a national emergency. Update: 3/16/2019 at 7:03 p.m. ET: This article has been updated to reflect that on Sunday (New Zealand time), authorities stated the death toll of the attacks on Christchurch mosques has risen to at least 50.